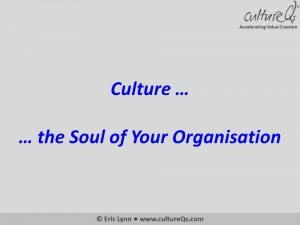 Culture lies at the core of who the organisation is, determining the life that management, employees, customers, suppliers, and all other stakeholders experience. And this in turn determines how it works and the outcomes (results) that emerge. A healthy organisation needs to nurture its soul: an organisation, like a human being is a dynamic living entity, forever evolving. Healthy intrinsically motivated people engage. So … why is it that relatively few organisations seem to recognise this? Now, what’s your next step? How are you going to enable this?